A properly installed and managed CCTV surveillance system can dramatically reduce crime levels; drops as high as 90% have been recorded where a highly visible CCTV system has been installed. 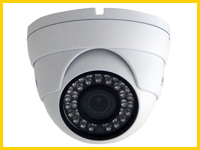 CCTV Camera types range from internal mini domes to external fully functional pan/tilt/zoom domes. All external CCTV cameras are fully weatherproof. 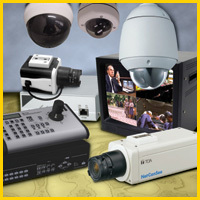 Wireless CCTV surveillance options are available for demanding applications. Several weeks digital recording of images, with playback facility; no tapes or daily user intervention needed. High quality yet maintaining operational simplicity. Search via event: sensors working in conjunction with the CCTV enable all relevant events to be quickly viewed. Applications would include the approach to a site so you can view all who have visited in the last few days or weeks. DDate and time stamped digital video recording to suit all budgets and requirements. Recording is done via Digital Video Recorders (DVR). The DVR is the centre of the CCTV system, types range in capabilities from four camera upwards, and we usually design systems with capability for expansion. The amount of storage on the CCTV system is selectable, and alarm sensors can be used to 'flag' relevant events making them easy to find among days or even weeks of video recording. Useful accessories for DVRs include lockable metal cabinets and remote keypads, meaning the DVR can be installed in a safe location and controlled from a convenient location. 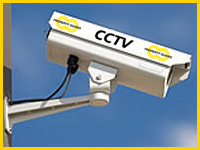 Our on going scheduled maintenance facilities mean that our CCTV systems continue to meet their operational requirement. Full quotations are provided on completion of a full survey. Contact us to request a survey.